The latest report from IMRB “Digital Divide to Digital Dividend” is about the increased broadband penetration in rural India. While many question terming 256K as “broadband”, I personally am comfortable calling 256K as broadband internet in India. We can’t compare ourselves with the western world where home users have 6MB of mouth watering bandwviidth at home. India is India. India witnessing technological progress is fine, but if it doesn’t touch the masses it isn’t worth talking about. Barely 10% of India’s schools (assuming rural) have computers, broadband is unheard of. By Dec 2010, the govt had targeted 20 million broadband connections. We achieved a mere 7 million connections. Who is to blame? By Dec 2014 India expects to have 214 million broadband connections. 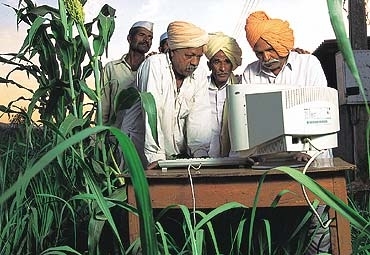 In Dec 2010, rural India had 15.2 million broadband users (not connections), of which 12.1 million users were active users. By Dec 2011, India is expected to have 29.9 million rural broadband users, of which 24 million are expected to be active users. 69% of rural population is aware of the existence of internet. Cool! Only 6 per cent access the internet from their homes, and 5 per cent from mobiles. The consumption of videos is on the rise in India. We do see that behavior on Oneindia Videos too. If a lot of content is available on videos we can expected even the not-so literate and/or illiterates to be using the internet (because they can understand spoken language, but not read). Either way, I do see as the broadband penetration reaches Tier-3, rural India, the demand for Indian language content increasing on the internet. How connected is rural India to the Internet?